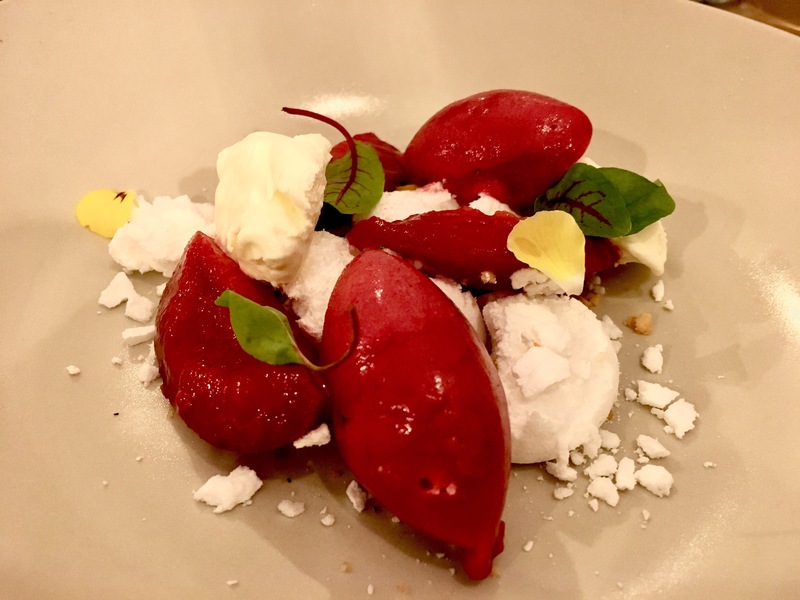 Ok so this time isn’t technically Michelin starred, but fine dining and a fine experience it certainly was. This time we were celebrating our office Christmas lunch… postponed to January. What a treat. 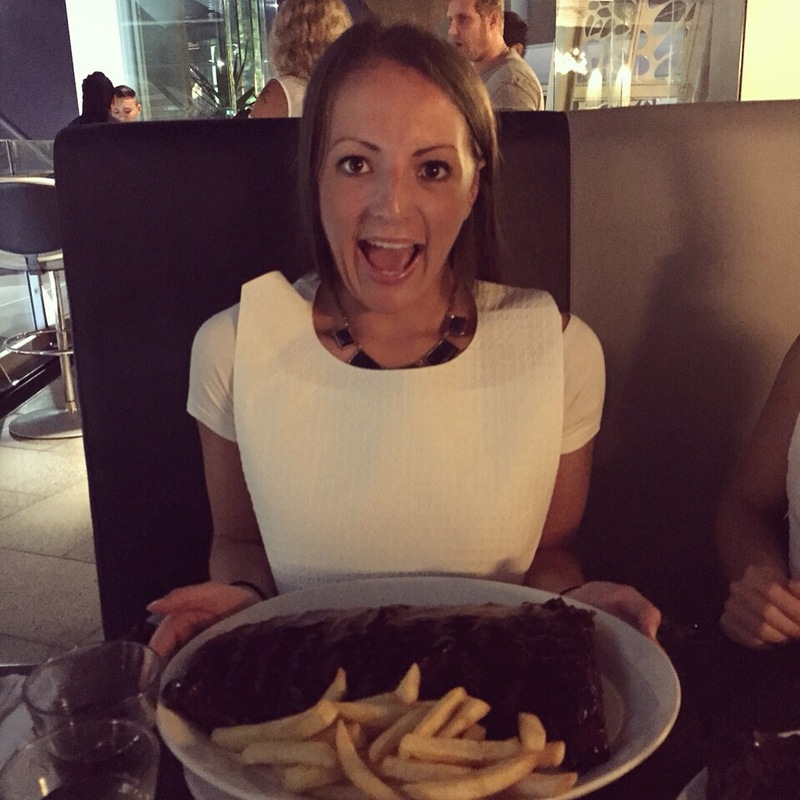 After fabulous previous occasions at Simpsons and Andy Waters (really should tell you more about that one), this time Han Eats was under pressure to deliver the foodie goods. 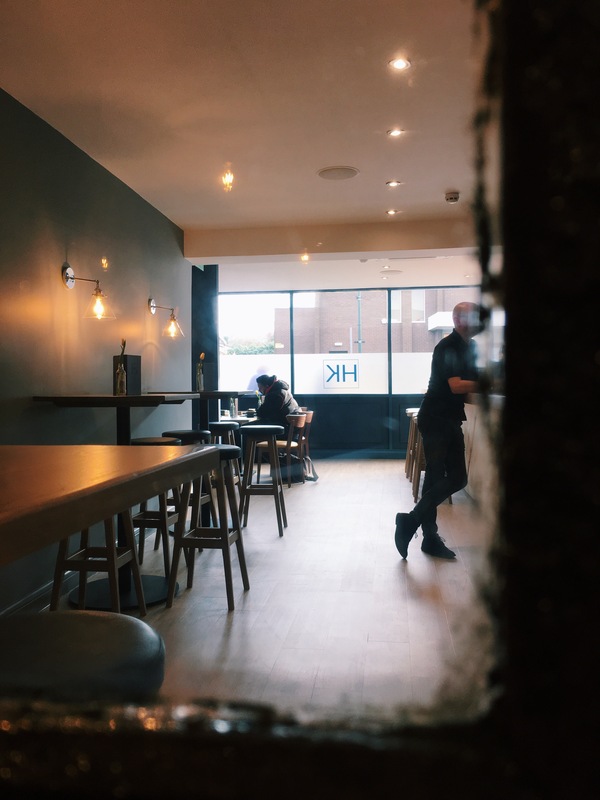 So newcomer Harborne Kitchen, after reading a reasonable amount of buzz about the place online (iChoose banged on about it for long enough), was the chosen one. Won’t go in to too much detail on decor, because everyone’s tastes are different and we’re all comfortable in different surroundings. However, I personally liked the slick, clean, minimal feel. Those yearning after the less fashionable white table cloth of yester year may not be so keen but sorry, this is 2017. Anyway, on to the main event. 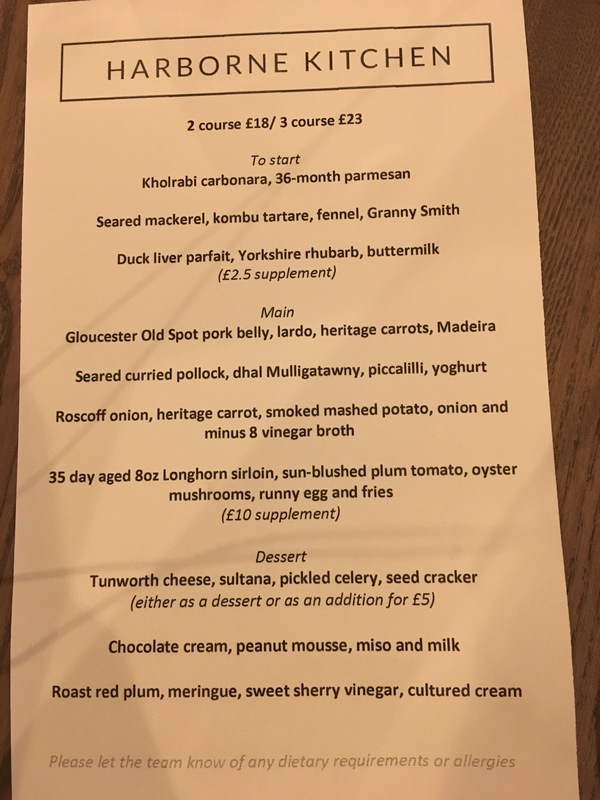 Firstly, three courses at lunchtime for £23 – what a barg. I don’t particularly like the common practice to add supplements on to a set menu price. It decreases your choice and leaves you feeling a little peeved/cheated. For wine, with NZ sauv lacking from the menu, we settled on a Spanish sauv, having tried the French “La Cote Flamenc”. I personally would have preferred the French, but I’m no expert. 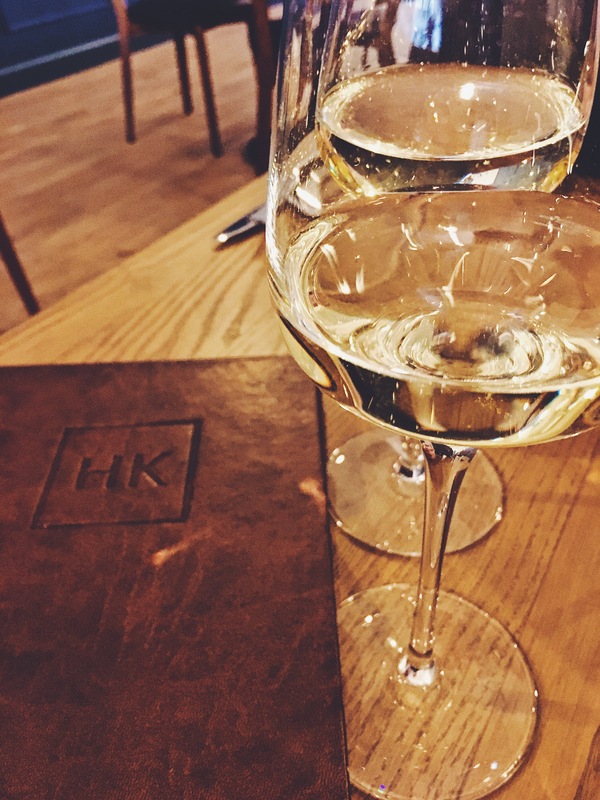 Winepressgirl – have you seen/tried this wine list?! 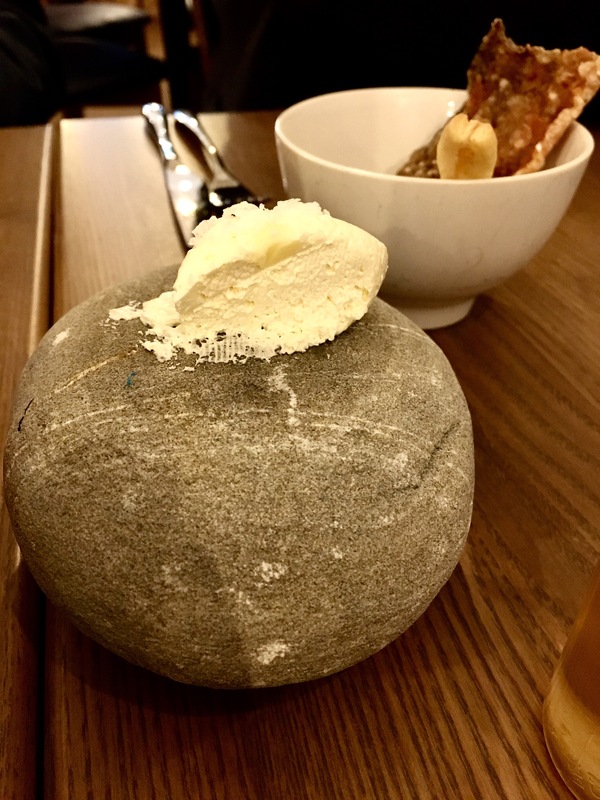 Post-ordering, freshly baked sourdough arrived with yeast butter, served on a rock (obvs), alongside fish skin crisps with a rosemary infused vinegar – ooeerr. 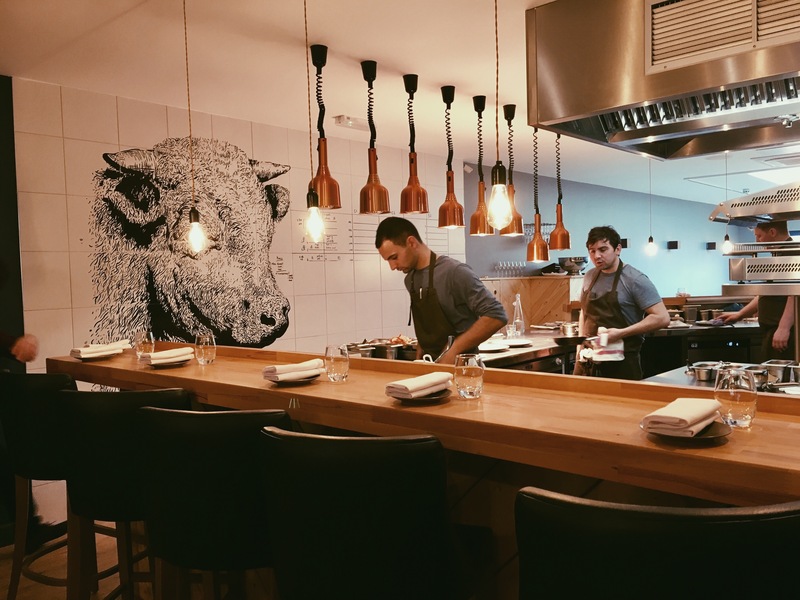 Some at the table dismissed – I liked. 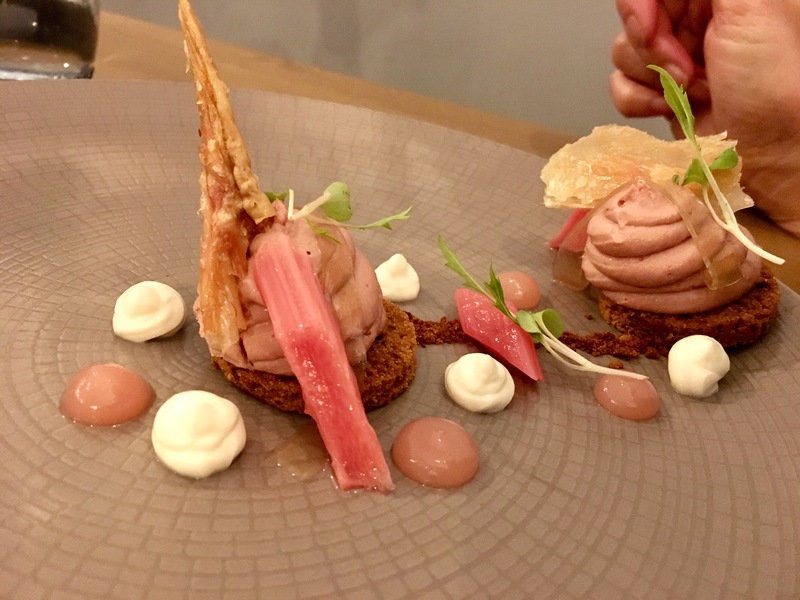 For starters, the other three went for the duck liver parfait, with spiced oatcake (I think), rhubarb, buttermilk (somewhere) and crispy chicken skin. Reliably informed this duck liver was as rich and tasty as you’d expect, contrasting well with the sharp rhubarb, with a take-it-or-leave-it crispy chicken skin, currently en vogue. 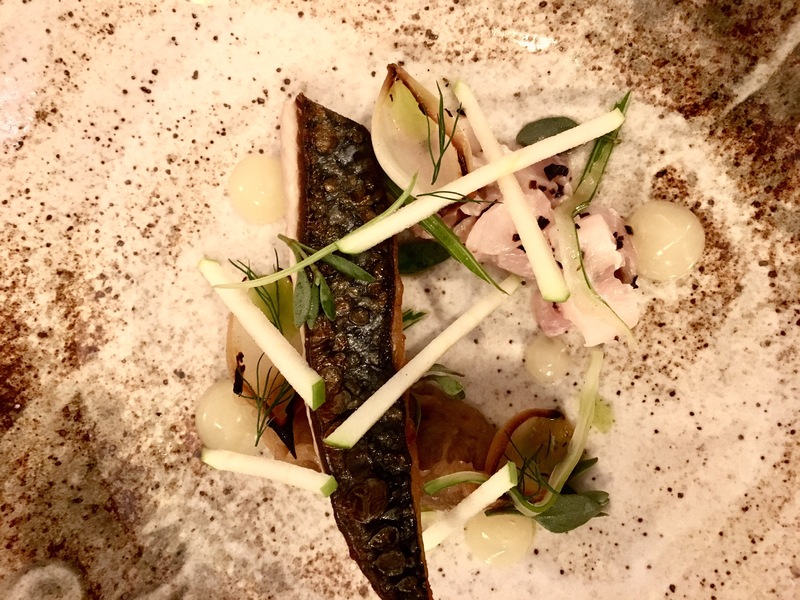 For me; seared mackerel, kombu tartare, fennel, lime ‘blobs’and strips of Granny Smith. An incredibly light, beautiful crispy mackerel and enjoyable tartare, the tangy fennel and lime mixing well. Textures galore. 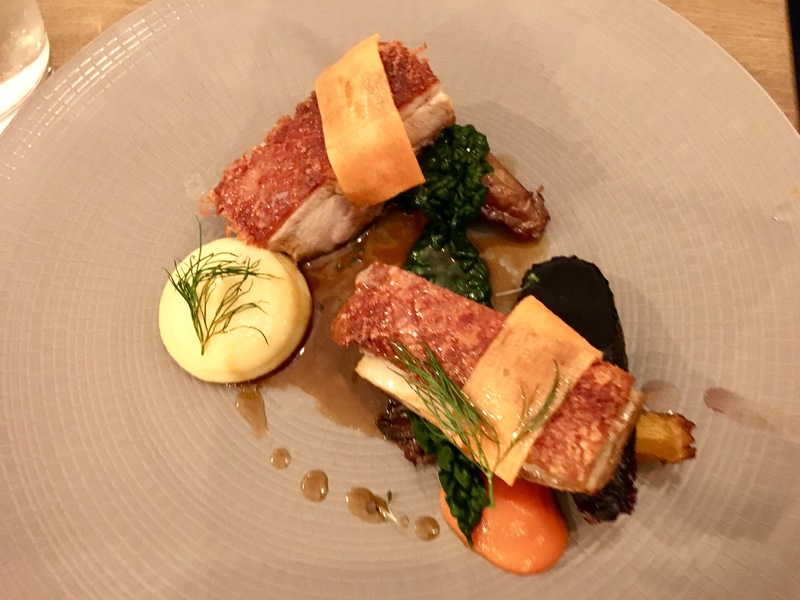 On to mains – three x pork belly; melt in the mouth chunks of meat, crispy crackle, with smoked mash (“a revelation”), cabbage, carrot and a madeira jus. 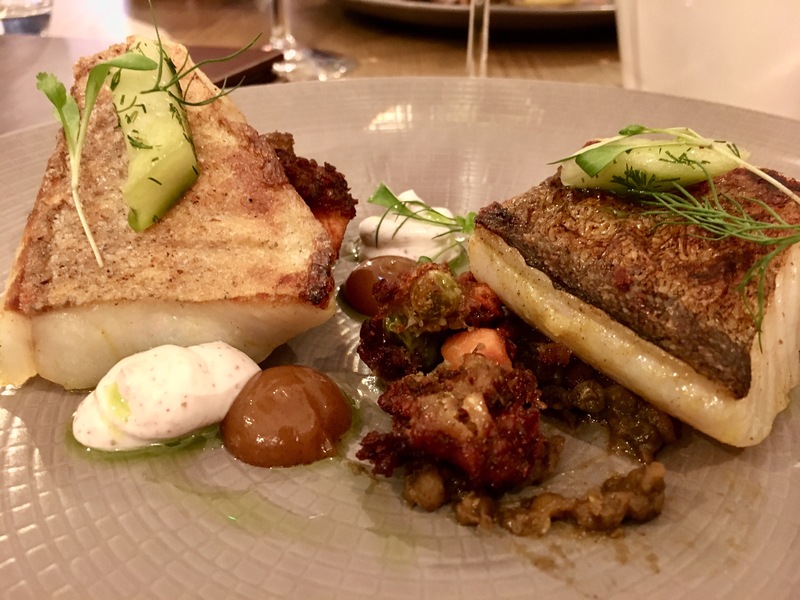 I thought I’d have food envy, but I was actually really chuffed with my unusual (but increasingly more frequent) fish choice. 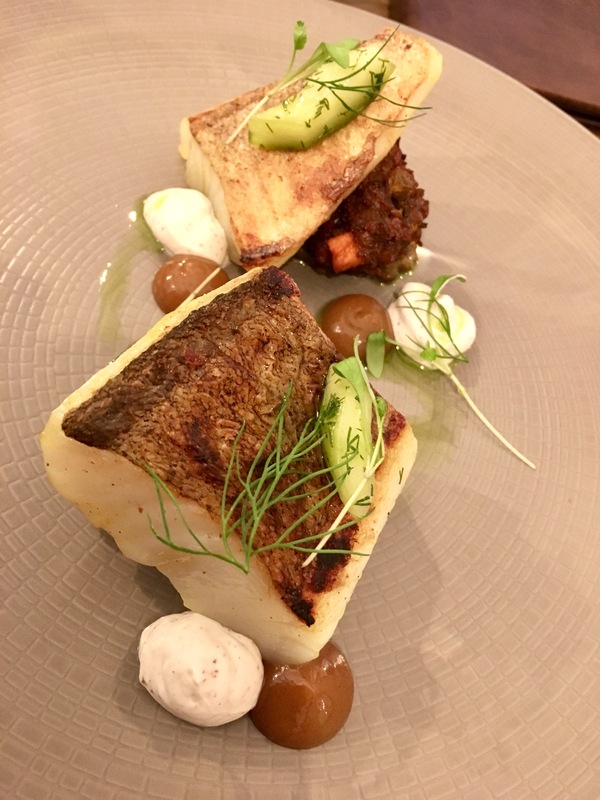 Me; seared curried pollock, with mulligatawny lentils, pakora, yoghurt, piccalilli and dill. Have to say the dill set this dish off for me, offsetting the curried flavours, along with the cool peppered yoghurt. DI-vine. I already couldn’t wait for dessert and all three great menu options were chosen around the table. 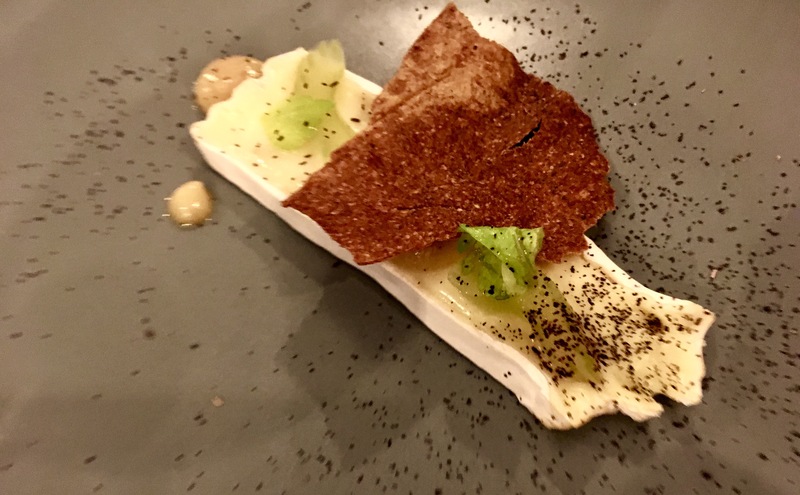 Tunworth cheese, seed cracker, pickled celery and kale ‘dust’ – kale DUST – really, REALLY?! However, only poncy thing about this food, I’d say. 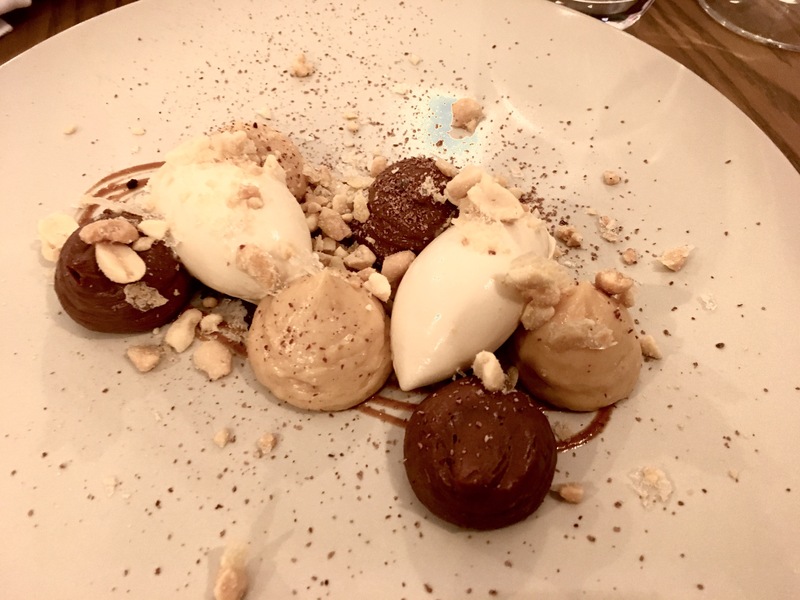 One of the best desserts I’ve had in a long while: chocolate cream, peanut mousse, miso, malted milk ice cream (like maltase’s in your mouth) and scattered peanuts. Cue boss swiping a scoop of peanut mousse before I’ve even lifted the spoon…! In fact, this would probably make my top five ever desserts. That good. HK also had this dish on their short bar snacks menu so if I happened to pop in and this was waiting for me for say, afternoon tea, I’d be one very happy girl. 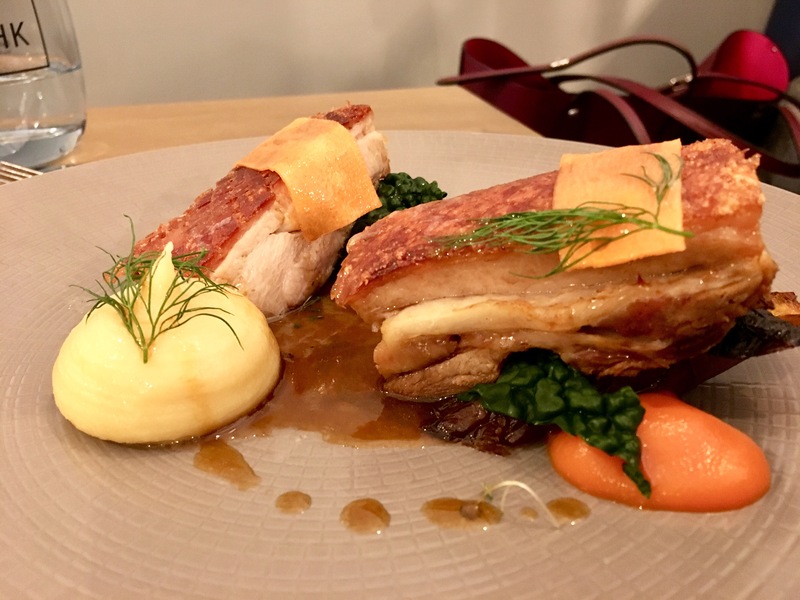 All in all, certainly one of those beautiful meals to be savoured, rather than devoured. One of the most impressive things at HK was the team – young and knowledgeable but with enough passion without it becoming overbearing. All very laid back, I imagine they even take a full, hectic pass in their stride. Ben looked after us superbly, even offering us the opportunity, during a quiet post-lunch service, to take us over to the kitchen for a nosey. No gas is used in the kitchen, only induction heat, and everything was SPOTLESS. A small, neat space for such smart cooking. 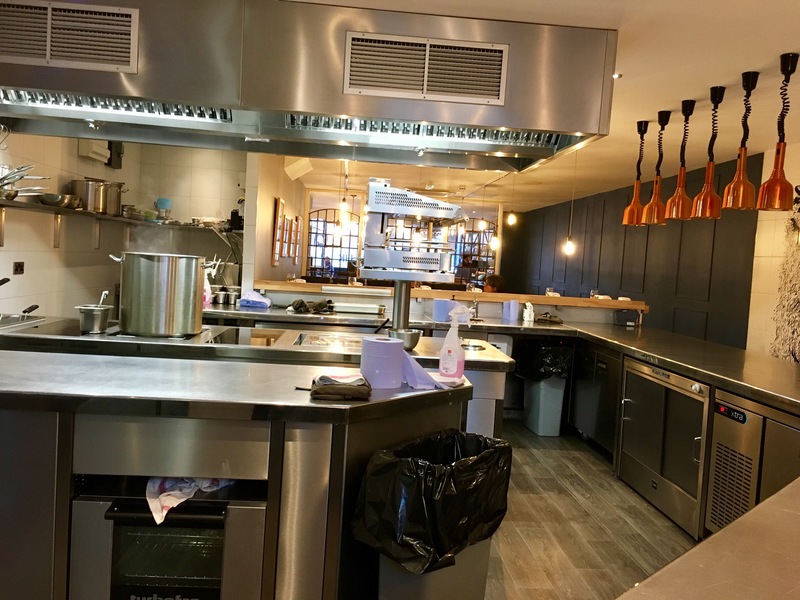 It was also lovely to also meet Jamie, head chef and owner of HK, formerly of Gordon Ramsay’s Michelin-starred Pétrus in London, who, like the rest of his team, was super friendly, modest and laid back. 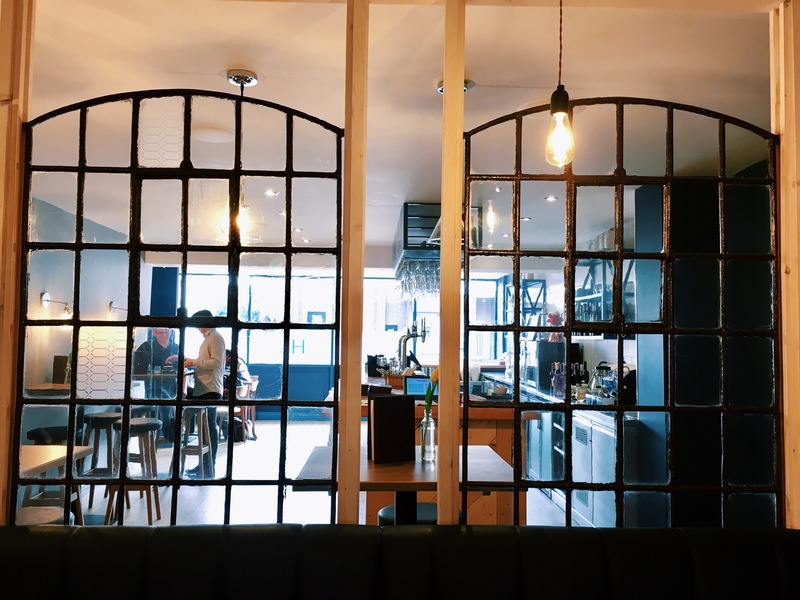 Jamie also told us they’re working hard on their bar, bringing in the likes of The Edgbaston for cocktail expertise, to beef up the experience and round off the venue has one of THE destinations in Birmingham, much like many of their Edgbaston gastro neighbours. So that would be lovely to return to and enjoy on a Friday or Saturday evening, to bask in HK’s buzzing glory alllll night long. 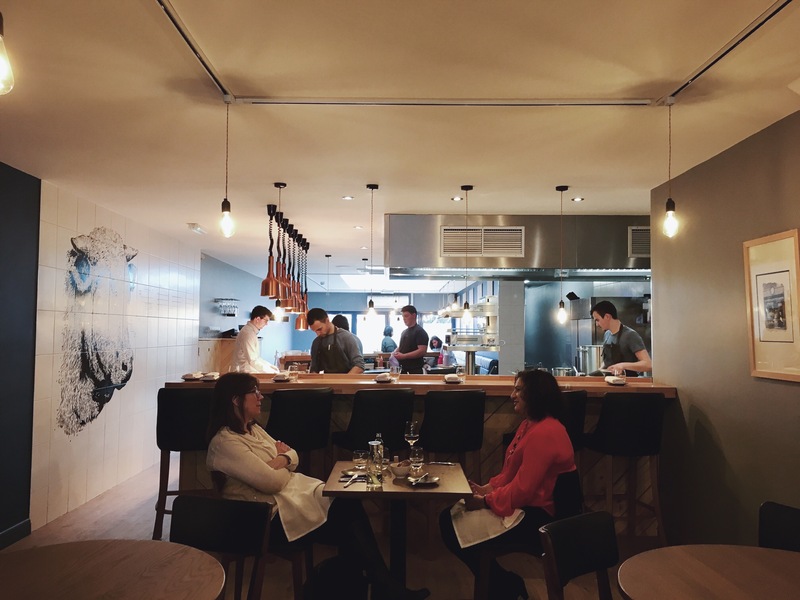 I suggest you do the same, as this really is a foodie experience to take advantage of NOW – I’d like to think this lot will rise to huge acclaim very, very soon. They change the menu every couple of months, with some daily/weekly changes to their current menu for the time being. 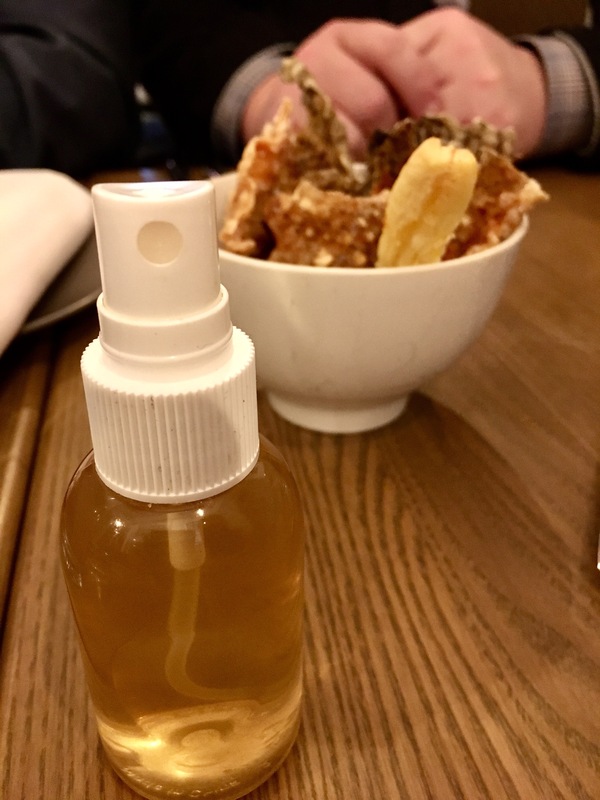 But prior to that I hope to enjoy the delightful sounding bar menu (short rib benedict on a sourdough crumpet – I mean 😍😍😍) and an afternoon treat in the form of THAT chocolate/peanut/malted milk delight. We (the office) paid for our lunch in full – the team clocked I was taking loads of photos for food blogging purposes but did not know beforehand.